In Guerrilla Gardening: A Manualfesto, David Tracey describes gardening as a basic human right, desire, and skill stemming from the origins of agriculture some ten thousand years ago (Tracey, 2007). Guerrilla gardening then, is a reclamation of that right through the cultivation and beautification of abandoned or underused land in urban environments (Tracey, 2007). The two guerrilla gardeners I know certainly demonstrate the ingrained skill of gardening and are tending underused land, but the land they have reclaimed is far from urban. Is this then, still guerrilla gardening? My parents live on three acres in a suburban community. They are hobby gardeners that value the art of reaping what they sow, but they are also in their sixties, still working full-time for love of their careers. Not wanting to give up their home gardens, they now rely on the help of two men, Edwin and Louis, to build and tend their gardens. 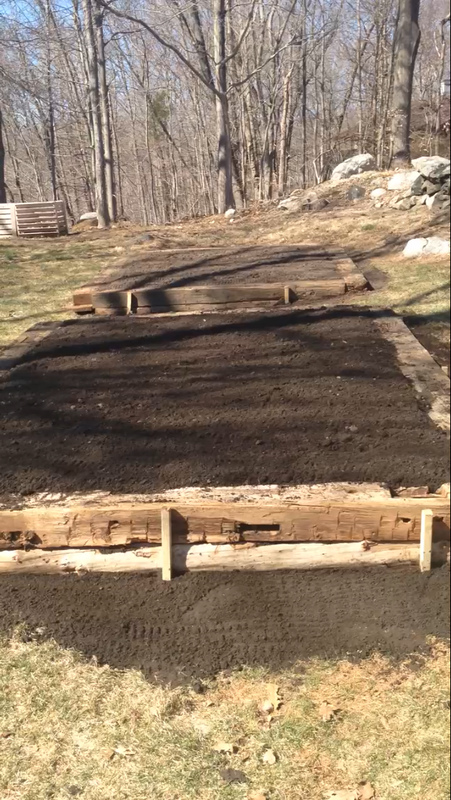 newest garden out of reclaimed beams from a barn on the property. 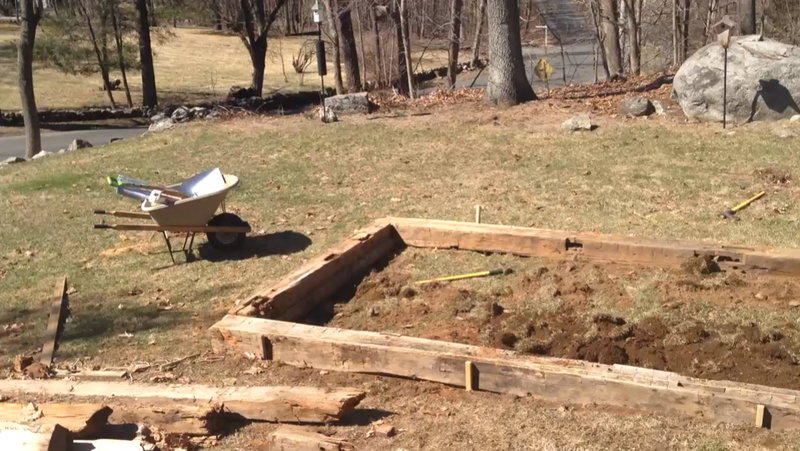 The completed beds filled with soil. 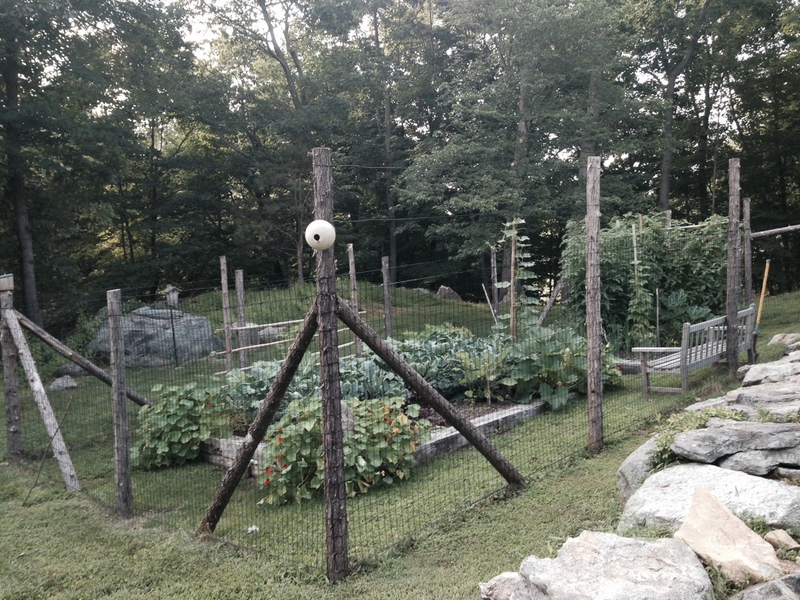 The garden, late spring, 2014. 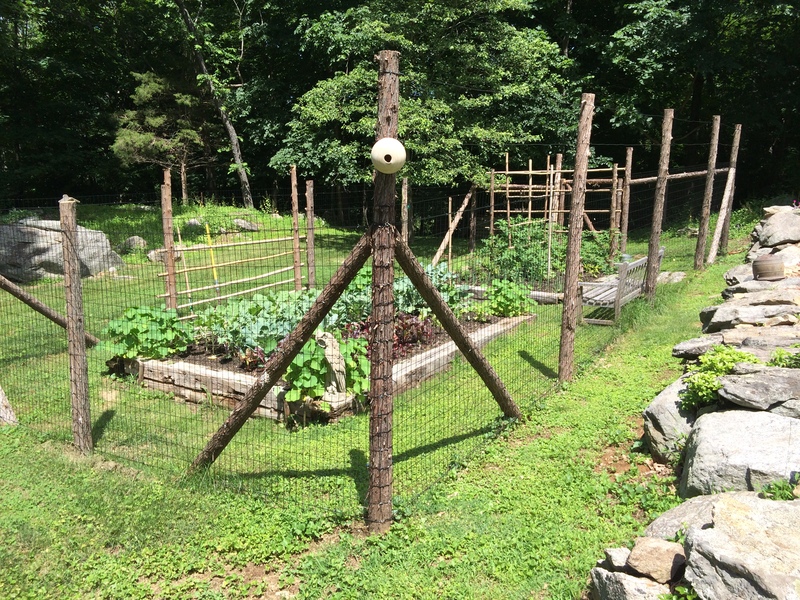 The garden, mid-summer, 2014. Notice the jungle of tomato plants in the rear bed, masterfully trellised with bamboo rods by Edwin and Louis! David Tracey declares that, “agriculture is a fundamental human skill” and that “plant cultivation is in your [sic] DNA” (Tracey, 2007, 28). If my only baseline for valuing the truth in this statement came from my personal experience I might not believe it, but having the pleasure of knowing and watching Edwin and Louis, I can say with confidence that gardening can be visceral. The wisdom these men have about tending a garden is generational and when you ask why or how they knew to do something, their reasoning more closely resembles an instinct than scientific knowledge. My father describes working next to them in the garden as “truly magical” and having witnessed it myself, it is a beautiful expression of embodied knowledge. The way they engage with the plants, inspecting them, smelling them, poking their fingers in the soil to check the growth of root vegetables, as well as the moisture levels and texture of the soil suggests an almost symbiotic relationship with nature. The men live and work on a horse farm that does not have a garden for them to tend and our garden did not fulfill their biological need to cultivate land. So, out of love, instinct and desire they have become guerrilla gardeners on a farm! While visiting them late this past spring, Edwin and Louis were very excited and proud to show my father and I their “gardens.” First they walked us behind a barn where, on a tiny strip of forgotten land between the barn and a stonewall, they had planted potato plants in a manmade hill. Then they walked us along the wall to the property line, where they had planted cantaloupe in the dirt under a bush in an otherwise grassy location and were using the wall to trellis the vines. In the horse barn, at the end of the stalls where the concrete foundation of the stable meets the gravel of the roadway, they had miraculously planted tomato plants and, having been given the responsibility of planting the window boxes on the barn, they had chosen to plant tomatoes and herbs, four feet above the ground, instead of traditional flowers. In the words of David Tracey, “you have a birthright to continue in nurturing seeds into plants” (Tracey, 2007, 28). Edwin and Louis undoubtedly exercise this right, planting in forgotten and unlikely spaces, enriching the land on which they work, and fulfilling their desire to cultivate land; a desire that I would argue along with Tracey, is in their DNA. Tracy’s (2007) book outlines guerrilla gardening as the transformation of abandoned lots in urban environments but it is not just in cities that land can be abandoned or underused. Though Edwin and Louis live and work on a farm, they did not have traditional land to cultivate and so, in the spirit of guerrilla gardening, they have reclaimed underused spaces, exercising their right to garden. I feel privileged to not only learn from them, but also garden along side them, sharing a love of the earth and the fresh taste of a ripe harvest. Their efforts are inspiring, and proof that a love of gardening can make a guerrilla gardener out of anyone and in any environment…even a farm! Tracey, D. (2007). The Big Idea (Or What to Say If You’re Stopped). In Guerrilla Gardening: A Manualfesto (pp. 19–35). British Colombia, Canada: New Society Publishers.